Well, the weatherman was right on Saturday's forecast. After waking up to rain/sleet/snow, the forecast was for clearing and sun. So a few of us bravely/foolishly headed for Swift Run Gap. The entrance and Skyline drive were snow covered but the weather cleared just as we began the hike. Since the Drive was closed we walked up the snow covered road to Smith Roach Gap, then headed north on the AT to Hightop Hut for lunch. After lunch we continued north back to the Drive and then to the cars. Group included Liz, John Brandt (yes, in shorts), Iva, Tricia, Dan Ralston, and President Moss. We also picked up a hiker, David, from DC with a second home in Central Va. He was a nice addition and we hope he will join us often. The weather forecast was predicting cold and very windy weather. 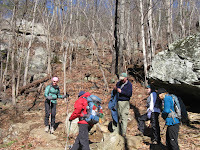 We did not quite know what to expect as we headed up White Oak Canyon Trail. It turns out that the weather and wind were not quite as bad as we thought they would be. There was a nice group of nine people who showed up for the hike. The waterfalls were beautiful as we were hiking up the trail. There was a small amount of ice and snow on the way. However, it began to melt as the bright sun came out. We hiked a little slower up the steep and rocky steps beside the falls. Marian Styles and Briana Taylor took some time to pause and enjoy the view of the falls. Paige Madison, John Shannon, and Ken Moss took advantage of the nice scenery to take some pictures. John Brandt decided to move a little quicker and met us near the top of the last set of falls. 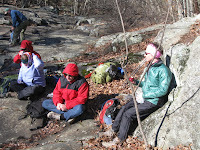 We decided to stop and have lunch overlooking the top of the falls. It was an ideal place for lunch- great view and not too windy or cold. 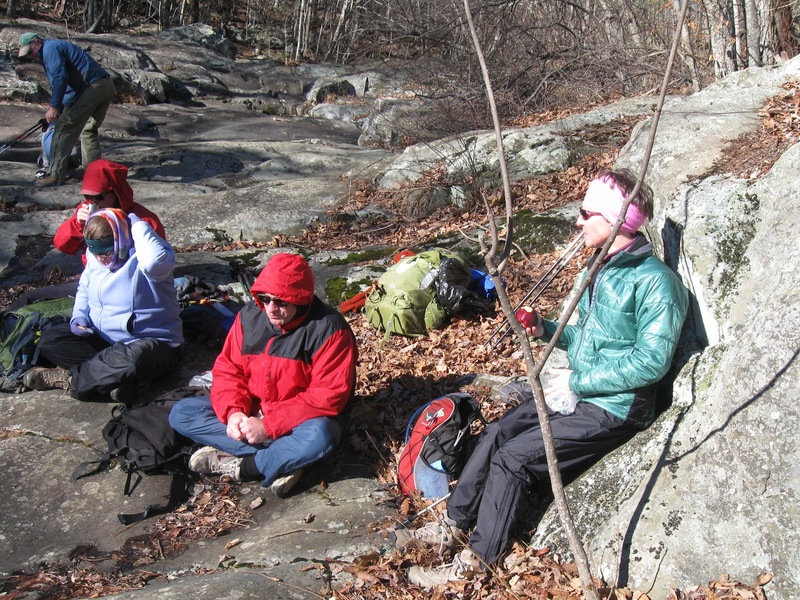 After consulting with John Shannon and Ken Moss, hike leader Liz Lyons decided to make this hike an out and back. We were not sure if we could complete the full circuit across the horse trail and down Cedar Run before dusk. We knew Cedar Run would be slippery and probably have more ice to contend with. The group did not seem to mind and decided it would allow time to stop at a vineyard on the way back home. We all made it back down White Oak Canyon Trail in one piece. After the hike, we stopped at DuCard Vineyard in Etlan. Some of the group did a wine tasting while others sat on the couch to enjoy the great view and some conversation with one of staff members at the vineyard. After the wine tasting, everyone sat down for some more conversation and rest after the hike. It was the perfect way to end a great day at one of Shenandoah National Park's most scenic hikes! With the clock past 9 a.m., hand ready to turn the car key, I looked in the mirror and saw the experienced trail crew of Pete Fink and Bev Maresca arriving, so three of us set up to keep the AT between Rockfish and McCormick Gaps in good condition. At McCormick Gap, we cleared waterbars, mainly removing leaves, then did some regrading in several spots to allow water to run off the trail more easily, mainly by removing the berm on the outer edge of the trail. After lunch, Bev and Pete had a business appointment while I continued regrading, and removed a couple of rocks that were potential tripping hazards, before doing more of the same at Rockfish Gap and widened a few feet of trail by removing earth which had moved down hill onto the trail. 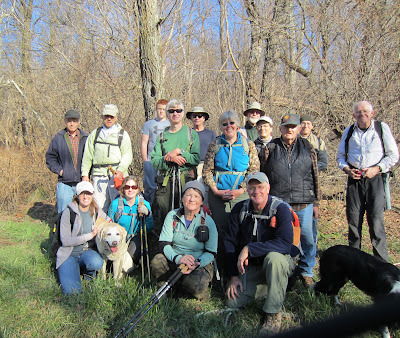 Charlottesville Chapter activities on a warm December day started with a short walk around Preddy Creek County Park by six humans and one dog. However, the 16th annual Christmas party was the day’s major activity. 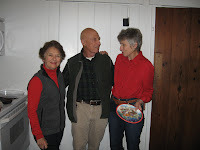 At the Dunlodge Cabin venue, cabin overseers Thomas and Mary Jorgensen, cabins’ supervisor Mel Merritt, and trail crew member Bill Downes and family put up decorations. When the guests arrived, not only did Dunlodge look plenty festive, but Christmas music was playing and a homey fire was burning in the fireplace. Andy Willgruber for Little Calf Mountain summit clearing, assistance with AT relocation, derecho damage cleanup, professional electrical work at Dunlodge and other cabins, and hike leading. Don Davis for many hours of work at Dunlodge and other cabins, AT relocation and other trail work, and derecho damage cleanup. 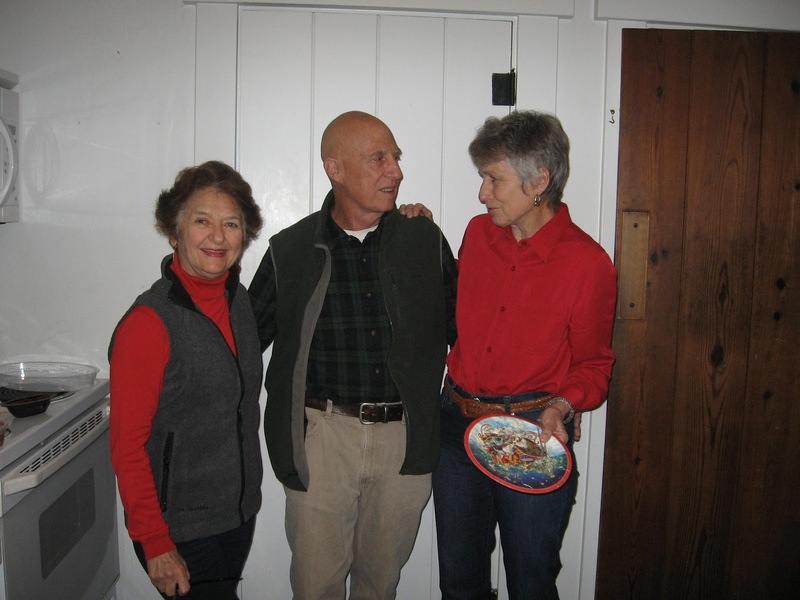 Iva Gillet for leading new and novel hikes and organizing hikes associated with other social events, as well as for her work on the Vining Tract trails. Ken Moss for upgrading the Chapter’s presence on the web, leading hikes, and posting hike activities. Marian Styles for contributions to reports on activities, storm damage assessment and cleanup, and organizing Chapter participation in an invasive plants workshop. New hike leaders Marit Gay, Pete Fink, and Liz Lyons for keeping hikes going. 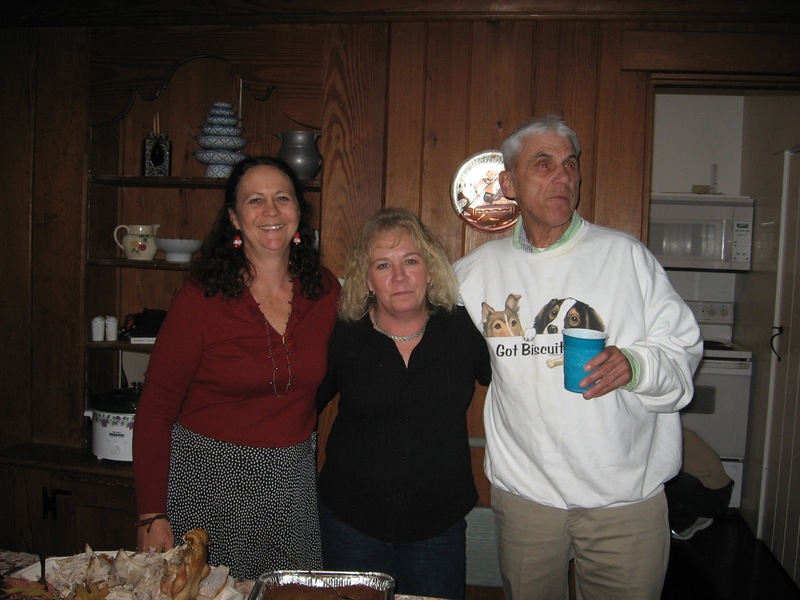 John noted that we would not have been having our party at Dunlodge without PATC cabins officers Thomas and Mary Jorgensen and cabins supervisor Mel Merritt. District Manager Don White also received accolades for all his contributions. 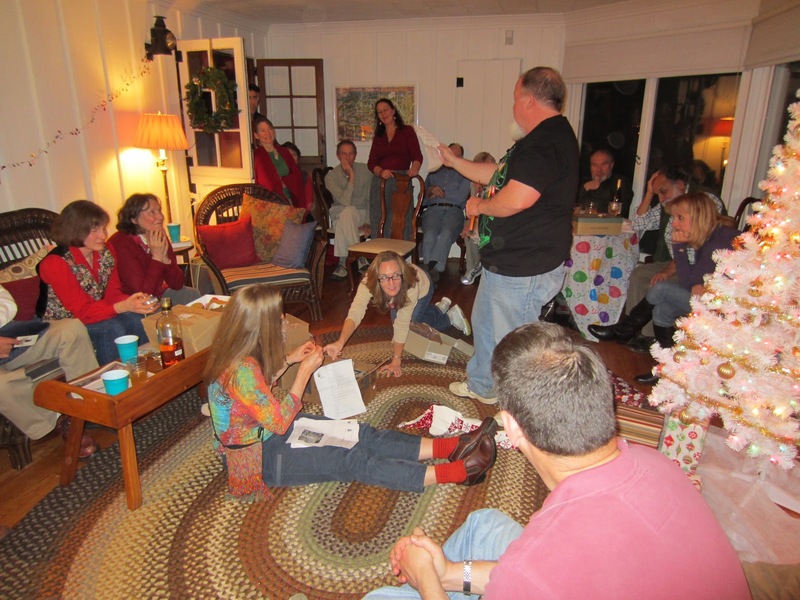 Early on, Debra Fisher opened a box containing a bottle of amaretto. Her appreciation was tempered by what else was in the box: the historic portable urinal, making its 15th appearance at the party. Debra proceeded to toss the urinal’s contents, which luckily consisted of Snickers bars, around the room. She then read aloud the official history of the urinal and flipped through the accompanying photo album that displayed pictures of past parties. Other gifts included a couple of survival kits, one for the fabled imminent end of the world and one for survival on the trail (two bottles of wine from the Jones Mountain area and a can of herrings). John Shannon, who only occasionally drinks wine, opened four of the eight or nine packages containing bottles of alcohol after all his previous picks were taken by others, but in the end he went home with a box of tea. The bottles of spirits were heavily traded and included amaretto, wine, ice wine, vodka, and moonshine. A framed print of van Gogh’s Starry night was traded a couple of times, as was a humongous box of Whitman’s chocolate. No amount of marketing by Geneviève Moëne enticed anyone to trade for her box of cookies, nor did Brian Muszynski’s antics with a tape measure spark any trades. In addition to the tape measure, practical items included a tire inflator, clippers with a trail work report form, and a hiking pack. After all the wrapping paper settled, AT District Manager Don White called Andy Willgruber, Don Davis, and John Shannon forward to thank them for their volunteer work on the major Appalachian Trail projects this year: relocating the AT on Little Calf Mountain and clearing heavy damage after the derecho. 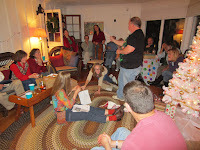 2012 marked another fabulously fun White Elephant Christmas party. Stay tuned, though: the 2013 party will be here before long! It was a weekend of two work trips- while Michael Seth was leading the Charlottesville chapter on a joint hike/work trip on the AT with the Valley chapter, Iva Gillet convened another group at Mutton Top on a cabin/work trip to reclaim the rock wall from the encroaching saplings, vines, briars and weeds. The Vining Tract, an over 200 acre parcel of land with 5 rustic rental cabins, is owned by the PATC. 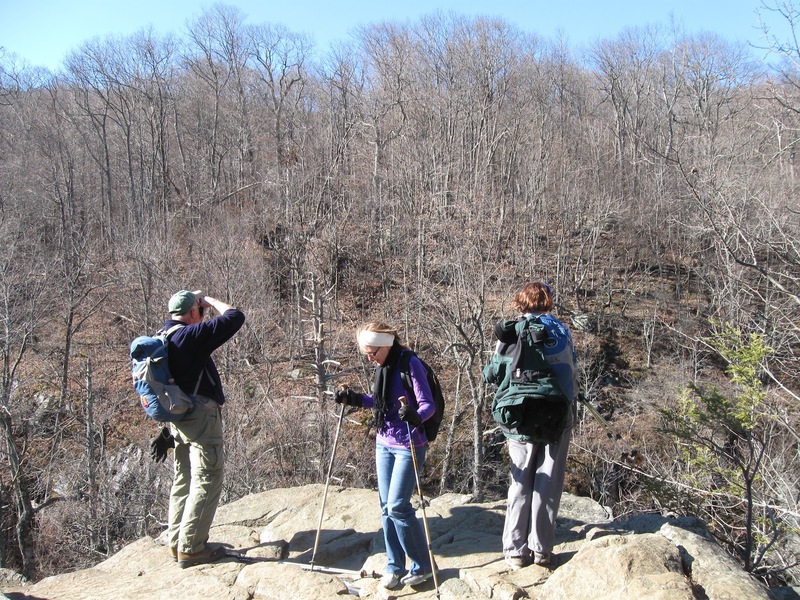 It borders the SNP, near Swift Run Gap, and offers hiking, bird watching, camping, outdoor grilling and relaxing on cabin porches. 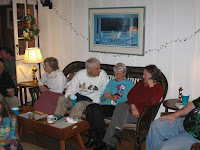 We had a group of 15 who stayed at Morris and Mutton Top cabins for the weekend. Bill Holman had organized a group of fellow Bridgewater College alums to join us for this unique work weekend. This group included head chef Jeff McCartney, Mike Noud, Mark Stivers, Bill McKinney, Craig Smith, John Hoover and his son Jack . Iva’s cabin group included Dan Ralston, CJ Woodburn, Barbara Martin, Joe Lotts, Brian Muszynski, Stephanie Reed, and PATC Supervisor of Facilities and Mutton Top cabin overseer, Mel Merritt. Saturday’s weather could not have been more pleasant. Low 60’s in December! There were many different opportunities to participate in the clearing and we switched throughout the day. Several folks used loppers to take down the small trees and thick vines; others used snips to clip the green briers and honeysuckle; Bill chain sawed the bigger trees down; and some gathered the piles of cut debris and dragged to the future burn pile. Some of the highlights of the day were: Brian swinging from long grapevines attempting to dislodge them from the upper branches of the trees; Dan, Joe, Bill McKinney, and Steph yanking the vines like a tug-of-war with the trees; and the phenomenal view we all enjoyed during our lunches. Meanwhile, Mel mowed the perimeter of the cabin, then proceeded to help clear the growth on the cabin side of the wall with the mower. After the front wheels fell off the mower numerous times, his efforts were thwarted with the final straw - a bent mower blade. There was a small fire ring in the middle of the field, but with so many working for 7 hours to clear the overgrowth, we soon had a pile accumulated the size of a school bus that would later take us 5 ½ hours to slowly add to the bonfire to burn. Brian, as lead pyromaniac, worked demonically throughout the afternoon and evening to ensure that every twig was incinerated, while the rest of us watched from the bonfire’s edge. After a short dinner break, we continued fire watching while making world class s’mores, drinking beer and wine, and enjoying stargazing with a perfect bonfire under the full moon. 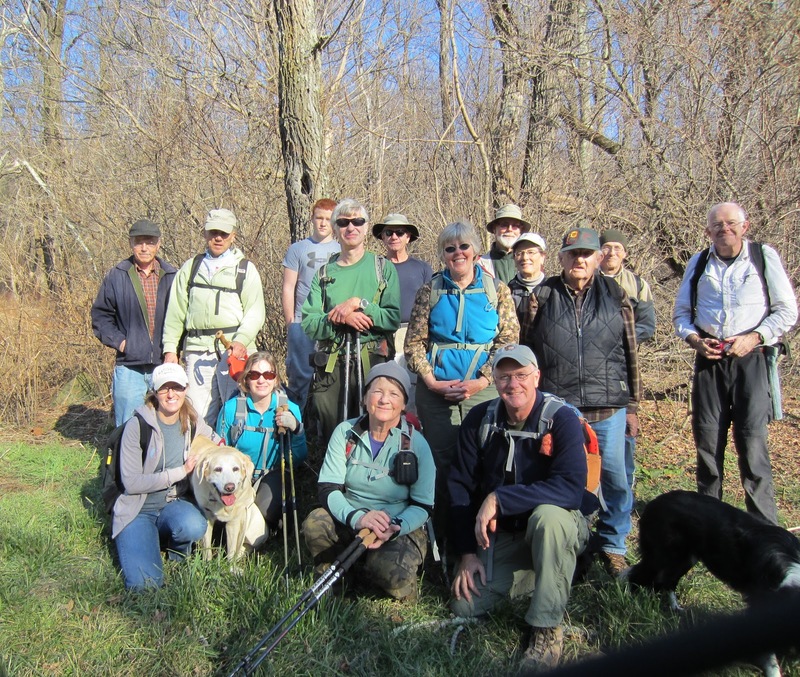 This route was planned to help long-time trail maintainer Alvin Dove, who for 30 years maintained trail so well that people knew they were on his section because of the excellent condition. In that time, Alvin gained great knowledge of SNP, both the trails and off-trail areas, including vegetation. Alvin launched Michael Seth on his way to learning about local plants and plants that grow here but should not. 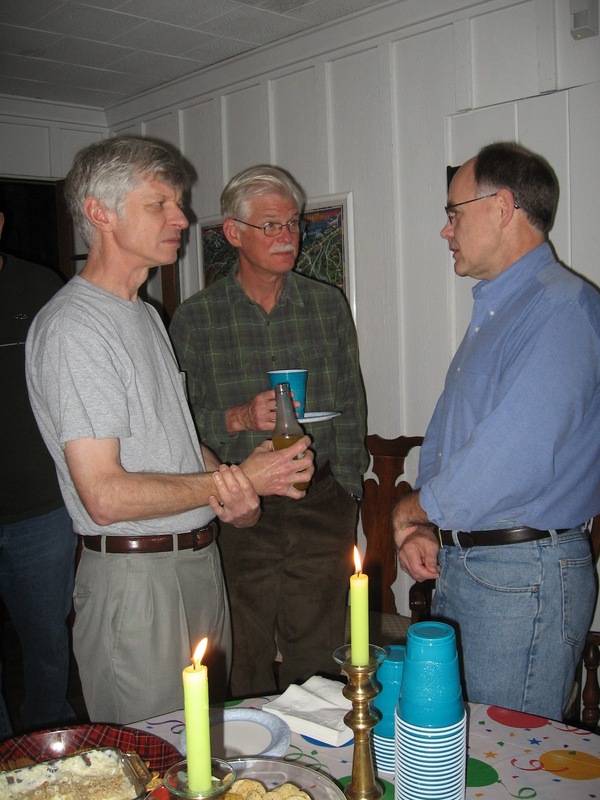 So Alvin indirectly started the knowledge of invasive plants within the Charlottesville Chapter through Michael. Before the hike started, in a surprise award ceremony, District Manager Don White presented Alvin with PATC honorary life membership: an award for those who have made major contributions to the club. 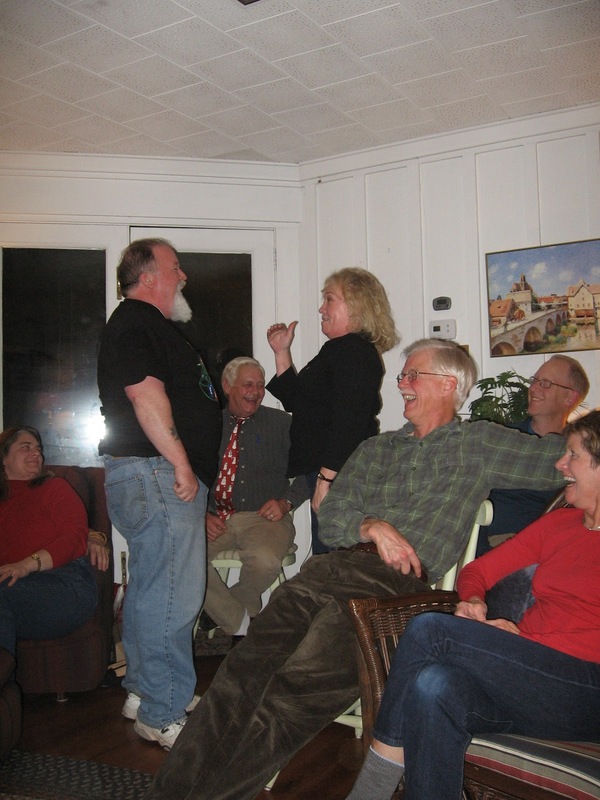 By the time the Charlottesville Chapter contingent arrived at Smith Roach Gap (John Shannon, Briana Taylor, Leon Gorman, Ken Moss, and Marian Styles), the ceremony had concluded and some folks had gone to arrange the car shuttle. In addition to Alvin Dove, we had the company of two other honorary lifetime members: Tom Johnson, a former PATC president, and Mark Gatewood. Mark has been a very active trail maintainer in SSVC. He created the Flying McLeods Trail Crew, is active in the Trails to Every Classroom project, and is a former SSVC president. As planned, Flying McLeods members Al Dahler, Mark Gatewood, and other SSVC members helped Alvin Dove clean waterbars on the first two miles of trail. The rest of the group cut a couple of fallen trees along that section and a few trees further along, but we didn’t encounter the expected vegetation overgrowth. An overlook of the Piedmont served as our lunch venue, and lunch had a chocolate theme. 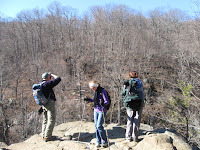 Between the warm temperature and the sunshine, it was tempting to linger, but we soon hit the trail. 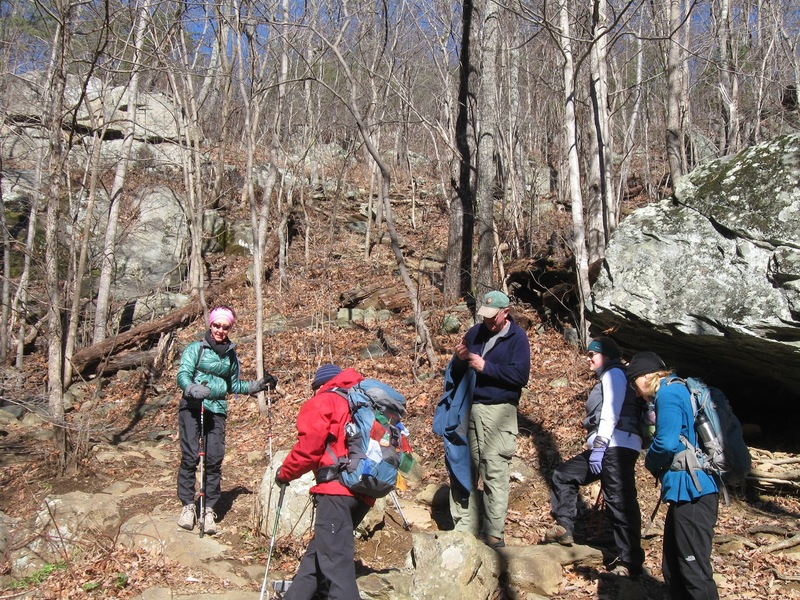 After completing our descent from the second of the three hills on the hike, we met the SSVC trail maintainers at Simmons Gap and we handed off a pair of borrowed loppers. With such lovely weather, even the final mountain provided pleasant walking. We reached Pinefield Gap at 3 p.m., and three cars carried us back to Smith Roach to retrieve cars there.